Alzheimer's is a progressive, fatal, degenerative disease that attacks the brain’s nerve cells, resulting in loss of memory, cognition, language, judgment, perception, and orientation. It’s a buildup of two different proteins in the brain. Plaques are deposits of a protein fragment called beta-amyloid that build up in the spaces between nerve cells, and tangles are another protein called Tau that build up inside the cells. Scientists don’t know what causes the buildup, or why some people get it and others don’t. There currently is no cure, or even treatment. Over time it affects all of the body’s physiological functioning and people lose their ability to talk, swallow, stand, and even hold their head up. If you have a brain, you are at risk. Alzheimer’s is the sixth leading cause of death in the United States, and is the most expensive disease in the country. It kills more people every year than breast cancer and prostate cancer combined - 500,000 Americans die every year from it. There are more than 5 million people in the United States living with it, and somebody new is diagnosed every 67 seconds. Almost 2/3 of those are women, and women are more likely to be the caregivers. I fell into that category at an early age. I was in my mid-20s when my father, Henry, was diagnosed with Alzheimer’s. He had been showing signs for years before, but as a strong-willed WWII hero he did a great job of hiding it. I quickly went from visiting him every day, to balancing his checkbook, to making meals, to going over three times a day. I hired a caregiver, but before long he wasn’t safe by himself for even short periods of time and I had to place him in a nursing facility. He had a lot of behavioral issues that were exacerbated by the disease, and he bounced around from facility to facility while I tried to find a good match. By that time I had quit my job and was dedicating most of my time to managing his care. He passed away at the age of 87 on June 19, 2012, after spending two and a half years on hospice care and two years on Medicaid. Alzheimer’s enrages me. It is a long, slow, loss of life and self. The person that is left is a shell of what they used to be. It impacted my life so profoundly, and I have an insatiable need to do something about it. Eight years as a caregiver drained me emotionally, physically, mentally, and socially. Now that I have that energy back, I choose to be an advocate for awareness and change. I joined the Junior Board of the Alzheimer’s Association (Greater Illinois Chapter) right after Dad died, and served as Vice President of Outreach. I spent three years as a Committee Chair for the Chicago Walk to End Alzheimer’s, and was repeatedly in the top 1% of individual fundraisers for the Walk. I am an Alzheimer’s Ambassador to my Congresswoman, and have traveled to our state’s capitol twice, as well as Washington DC, to lobby for government support and funding. I am a Certified Dementia Practitioner (CDP) and a certified support group facilitator. I served on the board for The Green Balloon, a nonprofit organization that provides funeral and cremation services to low-income people with Alzheimer's disease. I am a consultant for a group at Northwestern University called They Forget, We Remember- amazing young people who are dedicated to Alzheimer's research, advocacy, education, and fundraising. I was on the advisory board for the Brain Health Center at Northshore University Health System. I have written and spoken about the disease and my experiences extensively, have been interviewed on television several times, and have presented at conferences, fundraisers, and education sessions. I want to see a world without Alzheimer’s. We cannot sustain it as a society- not financially, not emotionally, not physically. It is our modern day epidemic, a death sentence for the more than 5 million Americans living with the disease, and we need to do something about it. Click HERE to see some stuff other people wrote about me. 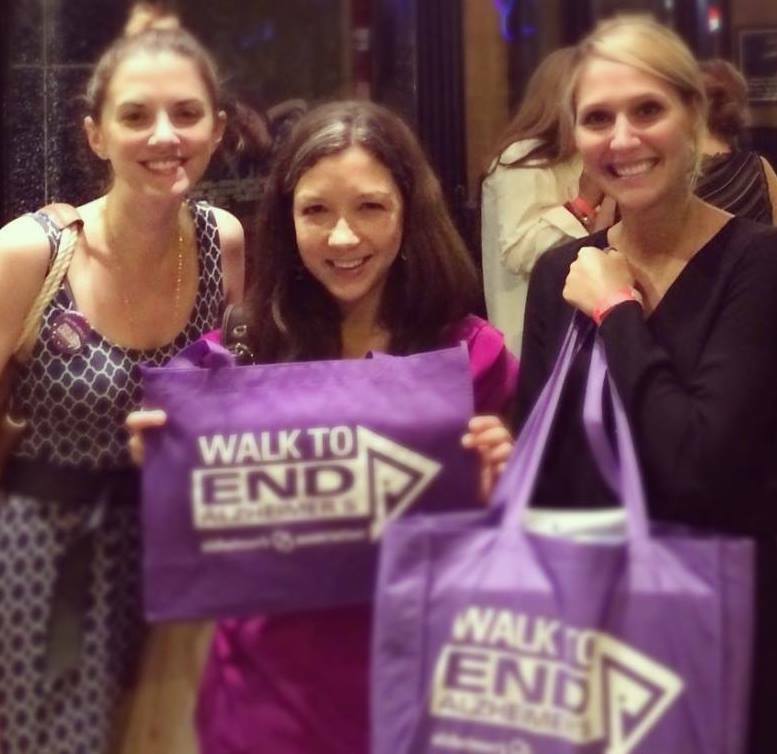 Click HERE to make a donation to my Walk to End Alzheimer's efforts- all the money goes to support Alzheimer's research, education, and advocacy.